15 June 2018 – Dig Delve – An online magazine about gardens, landscape, growing & making. The last few weeks of growth have been remarkable, the volume and intensity lusher for the wet start and the thunderous, still growing weather. In this lead up to summer the garden was texturally wonderful, the layering of foliage acute for the absence or scarcity of flower. Finely divided mounds of sanguisorba, spearing iris and mounding deschampsia all readying themselves, but yet to show colour. A sense of expectation and the build up to the first round of early summer perennials we have today in this posy. The colour in the garden is designed to come in waves, like a swathe of buttercups in a meadow, that leads your eye from one place to the next and builds in intensity and then dims as the next thing takes over. After an awakening of single peonies, the salvias are the next contrast to the foundation of greens, which I like here for their ease in the landscape. 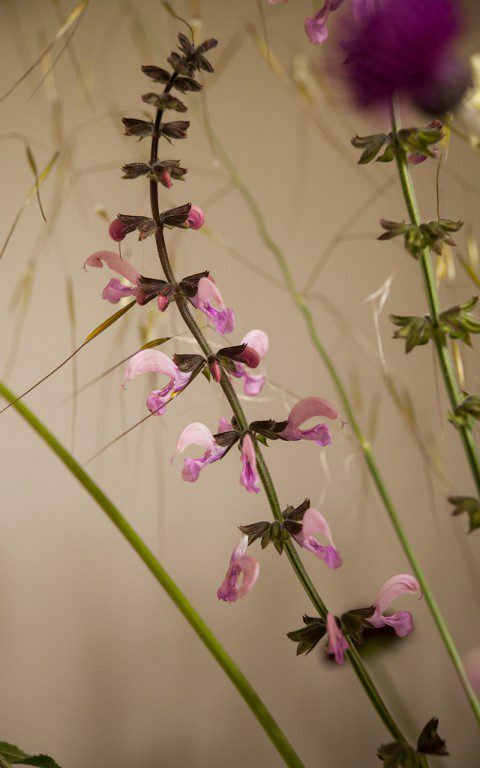 Though I have never found our native Meadow Clary (Salvia pratensis) on the land, it felt right to bring it into the garden in its cultivated form. We have two named varieties which are early to show and good for their verticality. Salvia pratensis ‘Indigo’, a rich, well-named blue and Salvia pratensis ‘Lapis Lazuli’, which was planted last autumn and is flowering here for the first time this year. Where ‘Indigo’ is perfectly named, ‘Lapis Lazuli’ has nothing of the intensity of the stone it is named after, nor of the ultramarine pigment derived from it. I have a nugget on my windowsill which I found once in Greece, sparkling in crystal clear shallows and catching my eye like a magpie’s. Although I was expecting something brighter and cleaner in colour like my find, the clear, soft pink of ‘Lapis Lazuli’ is anything but disappointing. It has been in flower now since early May for a whole three weeks longer than it’s cousin ‘Indigo’, rising up to two feet in widely spaced spires from a rosette of puckered, matt foliage. I expect it to still be looking good at the end of the month, but shortly before it starts to run out of steam, it will be cut to the base to encourage a second flush. The first cut back is always hard, because the salvias are a magnet to moths and bees, but we performed the same severity of cut on ‘Indigo’ last year and it rewarded us with a new foliage and then flower in August. Salvia nemorosa ‘Amethyst’, the second of the salvias in this posy and far better named for it’s jewel-like colouring, will also respond to the same treatment, but it is important to act before the energy has gone out of the plant by curtailing its show before it finishes flowering naturally. Energy put into seed will thus be saved and replaced with more flower and the reward of fresh new growth. The cirsium and the cephalaria are also encouraged to produce a second round of foliage by cutting them to the base immediately after they flower. 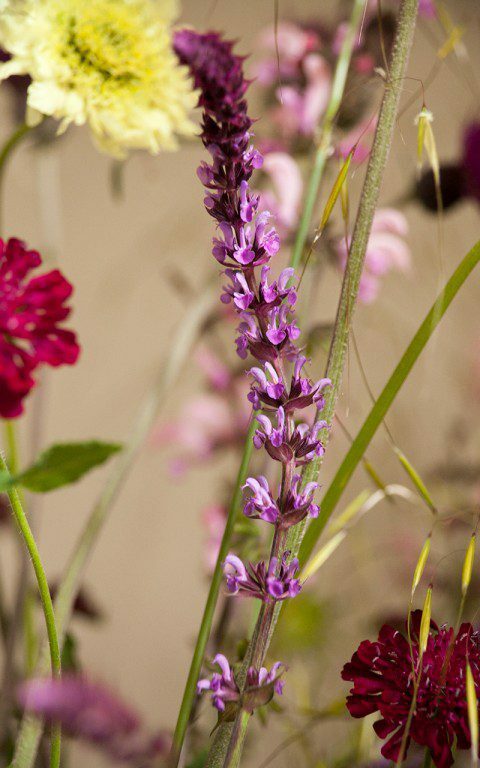 Though they are less inclined to throw out more flower, refreshed foliage is just as useful in an August garden, which needs the greens from this early part of the summer to keep the garden looking lively. The Cirsium rivulare ‘Trevor’s Blue Wonder’ in this bunch grows down by the barns, where its early show coincides with baptisia. Though not remotely blue – a theme that is coming through in this posy, it seems – I love the bluer purple of this form just as much as the garnet red of the Cirsium rivulare ‘Atropurpureum’. 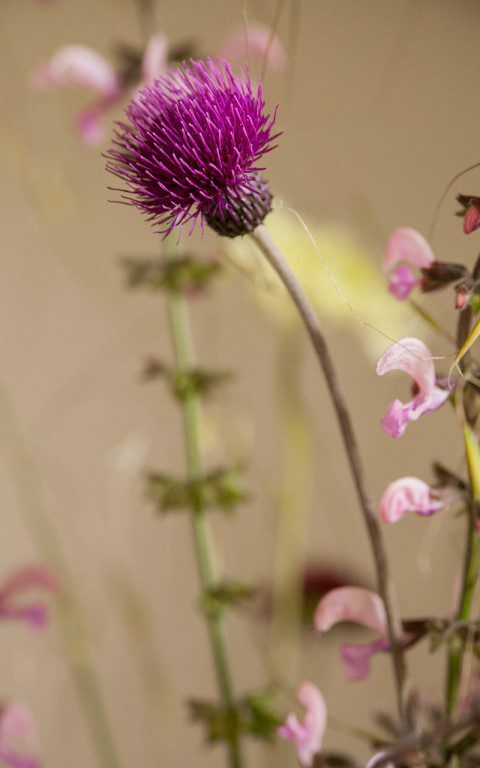 These early thistles like plenty of light around their basal clump of foliage and look best for having the air you need to appreciate the way their flowers are held high and free of foliage. Cephalaria gigantea is similar in its requirements and looks best when it can punch into air without competition. I grow it as an emergent amongst low Coreopsis verticillata ‘Moonbeam’ at the Millennium Forest in Hokkaido, where they grow ten feet tall on either side of a winding path. The creamy yellow flowers are delightfully sparse and the terminus of a rangy cage of airy growth. Here on our hillside they grow six or seven feet at most and right now appear head and shoulders above their partners. A single plant will leave a sizable hole in a planting if you choose to fell it after flowering, as I do for fresh growth, so it is wise to combine it with later performing partners that ease its temporary absence. Asters, grasses and sanguisorba cover for me here. I have two more species that are part of the new planting and will flower for me for the first time here this year. 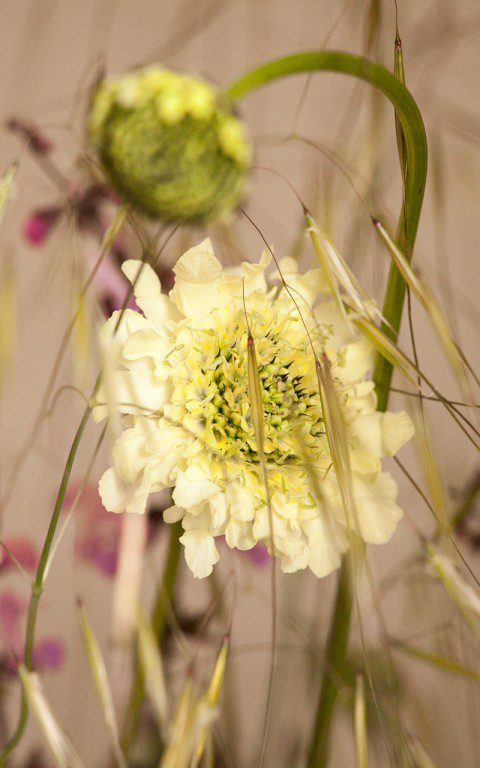 Cephalaria alpina is a smaller cousin which is more delicate in all its parts, terminating at about four feet and forming a low mound of divided foliage. Cephalaria dipsacoides, teasle-like in its naming and also in its vertical nature, is up to six feet tall, but grows upright from the base. Creamy in colour like its cousins, but differing from all the plants in this posy in being later to flower and prolifically seeding if it likes you. 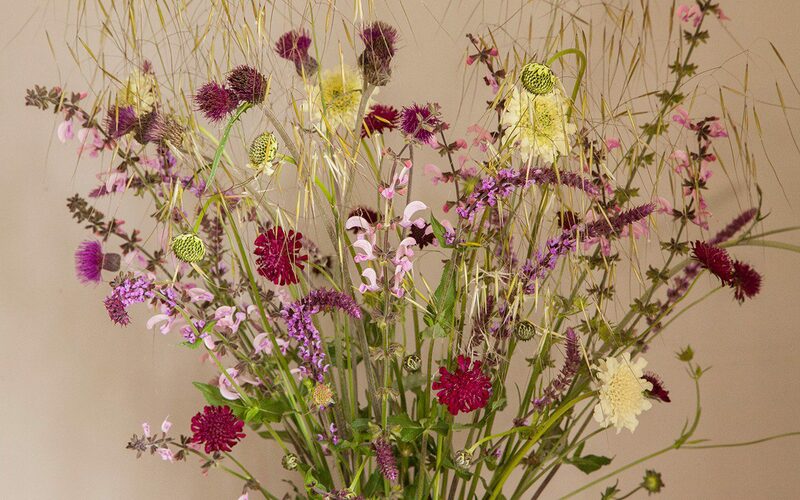 Although I love its seed heads and the structure they offer the autumn garden, I will be cutting the plants down prematurely before they seed. A practice I am having to employ here with several of the self-seeders, as I do not have the manpower to manage the progeny. A case in point being Knautia macedonica, that I will now treat as a useful filler where I need something fast and reliable. Our ground is almost too rich for this pioneer and in year two the plants splay fatly where they have been living too well. It too seeds prolifically, and my failure to deadhead them last summer resulted in a rash of seedlings this spring, which showed that it could be a problem if left to go native. 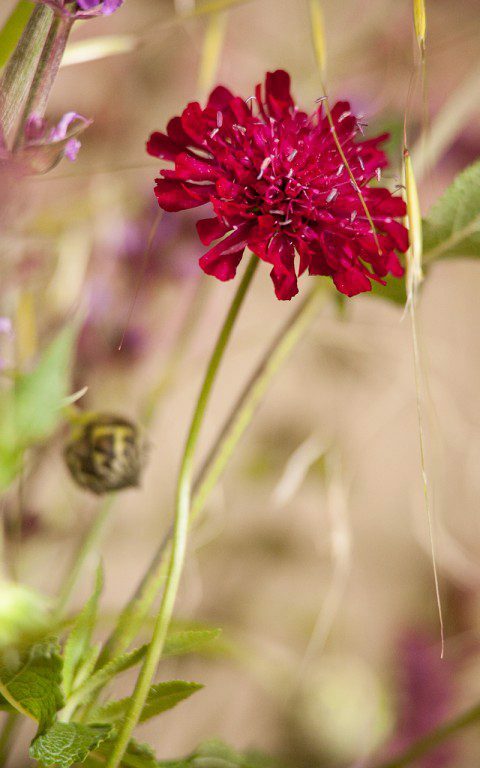 A few seedlings on standby, however, will provide me with gap fillers where I need them and a succession of this ruby-red scabious that hovers amongst its neighbours. We pull any pink seedlings, favouring the bloodline of those with darker genes. 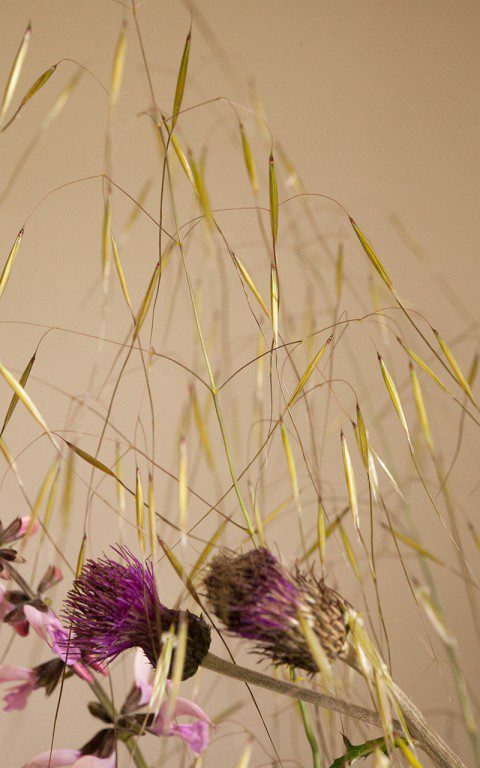 Stipa gigantea, the Giant Oat Grass is a plant that I have not grown since Home Farm, where it was a mainstay of the Barn Garden. For a while this grass became so fashionable that I avoided using it, despite its obvious beauty and, without enough room to grow it in the Peckham garden, I gave myself a breather. However, I am very happy to have it back and have given it the room it needs to look its best and for its low mound of evergreen foliage to get the light it needs. Right now it is at its most captivating, the lofty panicles, pale copper before turning gold and heavy with yellow pollen, dancing lightly to catch the long evening light. It is an early grass, bolting sky-bound plumes in May and taking June in a shower of luminosity and light.